If you're after bling, you shouldn't be looking at Nokia's E50. 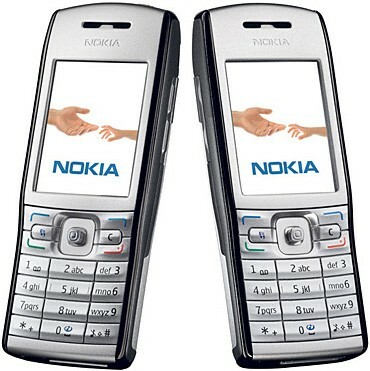 It runs a very competent operating system in Symbian S60 3rd edition and it has plenty of capability, but the prime target for the E50 is people who want to get things done quietly--that includes a fair smattering of business people as well as the more clean-cut consumer types. The E50 comes in two versions: With and without a camera. T-Mobile loaned us their camera-less version for review. There is a price differential, of course, and checking prices at the Nokia online store we found the camera-less model for 199 pounds and the model with a camera for 209 pounds. We have to be honest--Nokia's E50 is not much to look at. Judging from afar, few would guess that this is a very sophisticated little handset indeed. Styled in silver and black, the E50 lacks the jaunty coloring of many of today's mobile phones. The color scheme means it looks like a phone with the emphasis on the professional rather than the frivolous, which is entirely the point. The E50's somewhat tall and thin proportions make it a comfortable phone to hold, though if your hands are small, you may find it a fraction too tall to sit easily in the palm. Nokia has a thing about providing small and fiddly on/off switches, and the E50's certainly no exception. The switch is in the top of the casing and, rather than being a physical button, it is embedded in a rubbery section that depresses as you push it with a fingertip. It works, but we'd have preferred a proper button. This isn't the only annoying button as under the screen sits a mini joystick. This type of control system never works well for us--we by far prefer a navigation pad. In this case the mini joystick is responsive enough, but we don't like the stubby feel of it under the thumb. The remainder of the buttons meet with approval though, and particularly good is the number pad, whose keys are large, nicely bevelled so they are tactile, and which overall feels very solid under the fingers. The Call and End buttons, softmenu keys, Clear and Menu keys are all slightly on the small side when compared to the number-pad keys, but are easy enough to locate and hit. There aren't many side keys. On the left is a pair of volume keys, while on the right, one key initiates voice dialling and the other is the Nokia Edit key. If we have a major gripe it's about the screen--it's certainly clear and bright, and its 240 x 320 pixels are sharp enough, but it's slightly on the small side. We found that, for example, Web browsing using T-Mobile's Web 'n' walk service on the handset worked well, but that the screen was pretty small for reading text. The E50 is a quadband handset with Bluetooth. There's 70MB of internal memory and you can expand on this using microSD cards. The card slot is relatively easy to access--you remove the solid metal battery cover and it's there on the left side of the casing. There was no camera on our review sample, but as we noted earlier, the E50 does come in a version with a camera. It shoots stills at resolutions up to 1.3 megapixels and will capture video, too, though only at resolutions up to 176 x 144 pixels--not anything near state of the art. While the E50 plays MP3 and AAC music files and turns out good volume and acceptable sound quality from its internal speaker, it ships with a mono earbud. The handset may not be aimed primarily at music lovers, but even the most hardened workaholic might want to listen to music at some time or another, and we can't see why Nokia has cut a corner here. If you want to listen to music in stereo you'll need to invest in a new headset, and this being a Nokia handset, it'll have to be one that can cope with the proprietary connector. We tried the headset from our trusty N70 and it worked fine. As you might expect from a phone aimed at serious users, there is a swathe of 'productivity' software on board. Tucked away in a folder called office is software for reading Microsoft Word, Excel and PowerPoint documents, for viewing PDF documents and for managing zip files. Be aware, though, as already noted, that the small screen is not ideal for things like viewing PDFs. Meanwhile, for email fans there is support for a lot of different email clients of the kind you might find at work as well as for standard POP email support. The E50 performed well. Because we didn't want to use its mono earbud to listen to music, we tended to stick to making voice calls and doing a little Web browsing, and so its battery lasted quite well. Nokia quotes 6 hours 48 minutes of talk time, and we certainly reckon you could go a few days between battery charges. Call quality was loud and clear and calls played through the loudspeaker were especially positive.